So much is written these days about the “war” between independent broker-dealers and wirehouses – mostly biased toward the “indies” winning – an article I recently read, which indicated that indie advisors have a much higher rate of client attrition, caught my attention. As it turns out, the discussion should be more about how an advisor has structured his/her business than what type of firm they are with. Why do clients leave their advisors? According to a survey by Cerulli Associates (and quoted in InvestmentNews), many clients leave their advisors because of high fees, and at a greater rate at the indies. For example, again according to Cerulli, only 5% of wirehouse clients left their advisors over high fees last year, while 16% left independent broker-dealers and 20% left dually-registered advisors. One explanation offered by Cerulli for this phenomenon is account size. Brokers at Morgan Stanley, Bank of America, UBS and Wells Fargo had about 24% of their business focused on customers with more than $5 million in investable assets last year, while just 3% of independent broker-dealers and 9% of advisors registered with both the SEC and Finra focused on accounts of more than $5 million. While to Cerulli the link seems to be between fees and account size, I think that the real issue is the link between fees and how clients are educated/serviced. Successful brokers/advisors have a value proposition that resonates with their clients from their first interaction. This should be the case for small as well as large accounts. Client acquisition is expensive, so brokers/advisors should only work with clients that fit into their value proposition – clients that they and their organization are able to service effectively. 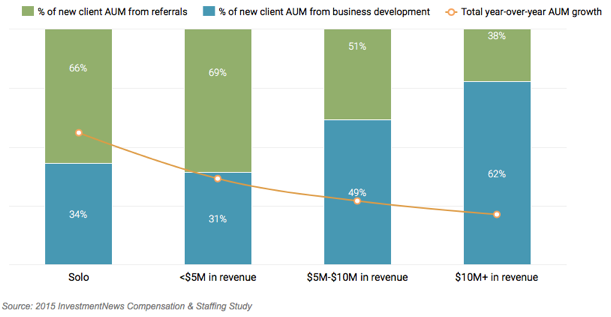 Even if a practice targets smaller clients, which many do, client attrition should not be so high. This indicates to me a lack of front-end client education. Even smaller clients should fit into a “niche specialization,” so again I don’t think account size should be the excuse for higher client attrition. This survey has few implications in the indie v. warehouse tug of war because brokers/advisors have proven to be successful at a variety of firms. At the end of the day, the Cerulli survey confirms the importance of advisors having a rational business plan in place and having a well-defined value proposition. Armed with these, fees or account size shouldn’t matter or be an excuse for client attrition. 9 – The Republicans will retain a majority in the House of Representatives, but the Democrats will retake the Senate, though fall far short of the 60 seats needed to enjoy a super majority. The result will be more gridlock, but that is a 2017 issue. 8 – President Obama will continue to go around the Congress with a number of Executive Orders, but the Supreme Court will uphold the illegality of his Order on immigration. He will also not be able to successfully close Guantanamo Bay before his term in office is over. 7 – ISIS will continue to wreak havoc in the Middle East and the world, despite increased bombing by the U.S. and its allies, and the U.S. will get drawn further into the battle. ISIS may lose land, but their global influence will increase, as will terrorist activities outside of the Middle East, including here in the U.S. There will be no leadership change in Syria. 6 – Russia’s global influence will continue to grow, as Putin aggressively props up the Assad regime and works to counteract the U.S. and its allies in the fight against ISIS. Tensions with NATO and Turkey in particular will increase, but Putin will stop short of provoking any military confrontations. 5 – The U.S. economy will continue to grow at a modest rate – in the 2% to 3% range, and inflation will remain tame. This modest growth will allow the Fed to tighten 3 times, but these will be small 0.25% increases and the Feds’s overall stance will remain dovish. 4 – The continued strength of the U.S. dollar (as European and Asian Central banks remain accommodative in their monetary policies), and the continued weakness in the price of oil, aided by new supply from Iran coming on the market, will continue to hurt profits of U.S. companies and will put a cap on the stock market. The market will be down 2% – 3% for the year. 3 – ETFs will continue to come under increased scrutiny, following a tough 2015. Because we will be in a flat market, active management and stock picking will outperform, and I would not be surprised to see another ETF-induced selling panic, followed by a lot of negative press over the growing influence of ETFs. 2 – Consolidation in the asset management industry, which was slow throughout most of 2015 before picking up at the end of the year, will continue and actually accelerate. There may also be a few large deals among the B/Ds as overall industry consolidation increases in the face of a second straight tough year in the stock market. 1 – And of course, some sports predictions: The Rio Olympics will be plagued by problems, in part a result of the political and economic turmoil plaguing the Brazilians. It will go down as the most poorly run and executed olympics in history. The Patriots will make it two in a row, overcoming all of their injuries and beating the Cardinals in the Super Bowl. Golden State will easily repeat as the champions of the NBA, and Alabama will beat Oklahoma for the college football national championship. I will unveil my Top 10 Predictions for 2016 next week, but for now, lets see how I did this year. Original text is following by my comments in bold. 10 – Hillary Clinton will announce her candidacy for the Presidency at long last. I am still not convinced that she really wants to run, but at this point I think the momentum is taking on a life of its own. However, I think she will be challenged by someone from the left of the party and her path to the nomination will not be easy as people thought a few short months ago. She will have to come-up with some new fresh ideas, and improve the effectiveness of her campaigning significantly. Partially right on this one. Hillary is indeed running, and she is being challenged from the left (see next paragraph). She does look energized recently, but she will need to come up with some new ideas to improve her image and prevent her from being cast as more of the same. Last week, I would have said that the challenge from the left would not have come from Elizabeth Warren. Now I am not so sure. Since I can’t stay on the fence, I predict that Elizabeth Warren will indeed eventually challenge Hillary. However, your politics aside, she has one glaring strike against her – she will be compared to Obama – a Senator with less than one term under her belt. Another candidate may emerge as well. I was wrong on Warren, but another surprising candidate did emerge in Bernie Sanders. Obama remains a problem for Clinton – especially on her role in his foreign policy. 9 – Sticking with politics, but turning to the Republicans, I am surprised that Jeb has set-up an exploratory committee, but I would still not be surprised if he doesn’t actually run. As for the other Republicans, Christie will give it a shot, but he has an awful lot of baggage that will haunt him. Luckily, since the election is not next year, I don’t have to make the prediction of who will win yet. Bush did in fact run, but I’m not so sure at this point that he is glad that he did. Christie is giving it a go, but still weighed down by Bridgegate. Who could have predicted Trump and Carson? 8 – Political gridlock will continue in Congress to some extent, but I do believe that the Republicans will try for lots of small victories along the way as opposed to going for major pieces of legislation. The President has signaled a desire to fight since the mid-term elections, so I think the atmosphere will be bitter. But if the Republicans have any hope of winning back the White House they have to show that they can govern better than the last Congress. There is still gridlock, and the President’s use of Executive Orders has made relations with Congress rocky at best. There were some small legislative victories – but not enough to turn around public opinion on either Congress or the President. 7 – The President will actually continue to work better with the Republicans than the liberal wing of his own party. Bill Clinton faced similar changes and was able to rescue the last two years of his Presidency. However, I still think that given the President’s penchant for executive orders, these will all be minor victories as well and his status as a lame duck will be solidified in short order. The left has been disappointed by Obama until recently, but he has been making attempts to please them lately (on climate issues for example). He hasn’t worked especially well with the Republicans this year either as mentioned above. He is pretty much going it alone. 6 – The economy will continue to chug along with moderate growth, nothing spectacular but nothing terrible. The U.S. economy will continue to outperform the rest of the world. Europe will fall into a very short and shallow recession, and I think Japan will rebound now that the elections are behind them. Watch out for problems in the developing economies, in large part due to the drop in oil prices that we have seen. This prediction was pretty accurate, although the Japanese economy has been slowing. The U.S. economy continues to muddle through. 5 – The biggest wildcard for the year is Russia – where the economic situation is deteriorating rapidly and sanctions are having a very major impact. The Ruble is in free fall, and the drop in oil prices is having a significant and negative impact. Continued turmoil in Russia could have a huge boil over effect in not only the rest of Europe, but the rest of the world as well. No one really knows how Putin will react and if these economic woes will make him more bellicose. But if any one thing can send the worlds markets and economies into chaos, it is Russia. Developments are worth keeping a close eye on. Russia was a wild card, but for different reasons than I thought. Putin is showing his military might and, especially in the Middle East, is filling voids left by Obama’s less-than-clear foreign policy. Forbes names him the most powerful person in the World (Obama was third). Enough said. 4 – The Fed will raise interest rates by July of next year, but I think that they will do so in a measured way an more slowly than many currently believe – in part because of economic weakness around the world. Inflation remains under control, with the only thing that can really throw us a curve here is if wage growth picks up significantly (which I don’t see happening). The market will react negatively when rates do go up, but will rebound and regain all of the initial losses within six months (as is usually the case after Fed interest rate hikes). OK – not July – insert December. But the trajectory of increases will be measured and inflation is still under control. Hey, who can really guess what this Fed is going to do? 3 – The stock market will have a below average year – and may in fact end down a little bit. There will probably be at least one 10% – 20% correction, either before or right after the interest rate increase. But corporate profits are still strong, and other economic positives will act as a floor on the market. But I see now compelling reason for a lot of upside in 2015. Pretty on target here – it hasn’t been a great year, we may end up down and there was a correction in the Fall. Only thing I missed here was strong corporate profits – as those have been weakening. 2 – Pundits will continue to focus on the growth of the RIA and independent channels, at the expense of the wirehouses and other traditional broker/dealers. But I see the continuation of the rebounds that the wirehouses have seen, and I think they will once again hold their own. There may be a few large mergers among the larger RIAs and perhaps one or two among the regional brokerage firms. There wasn’t a lot of merger activity – and I think all of the channels held their own during the year. All in all, a pretty uneventful year. 1 – The aforementioned Elizabeth Warren will continue to be a thorn in the side of banks and other financial services companies, and she will continue to fight anything or anyone that has a connection to Wall Street. While this may propel her into a run for President, I don’t see her having much impact on legislation, especially since the Republicans now control both houses of Congress. Warren is still a popular figure on the left, and she is still the enemy of Wall Street. She has definitely had more of an effect in turning Hillary to the left than in impacting legislation. Finally, a little sports. I see Alabama over Oregon in the National Championship Game and the Patriots over the Seahawks in the Super Bowl. One out of two is not too bad here. Glad I got the Pats right!